This seller stumbled upon one of the year’s biggest trends using Jungle Scout. ground up, crushing their goals and building the freedom they want for their lives. This year, one product trend eclipsed all others. Solar eclipse glasses. Andrew Nakamura saw the potential for strong sales for solar eclipse glasses in Jungle Scout. On August of this year, there was a ton of buzz around the first solar eclipse to be seen in the continental United States in 38 years. By the time the eclipse rolled around, protective eclipse glasses were hard to come by. Amazon sellers sold them like hot cakes and Andrew Nakamura was one of them. Solar eclipse glasses were only his second product. He sold them wholesale through Amazon over the summer. They ended up making up the majority of his revenue YTD. Andrew’s first product, training chopsticks sold OK, he said. He just about broke even. Now, he’s looking to branch into private labelling and find some sustainable, long term product opportunities to bring him closer to his goals. “It offers the flexibility I would like, too. That’s just the beautiful thing of using Amazon FBA, especially with a private label product. Once you find a product, you can pretty much streamline it where you’re not even touching the products or the inventory. And I think that was one of the biggest benefits I saw with the program. Andrew was also ahead of the trend when it came to fidget spinners. But, this was before he was selling products on Amazon. He initially sold through eBay, but found it overwhelming to have to package and ship 80 to 100 fidget spinners a day. 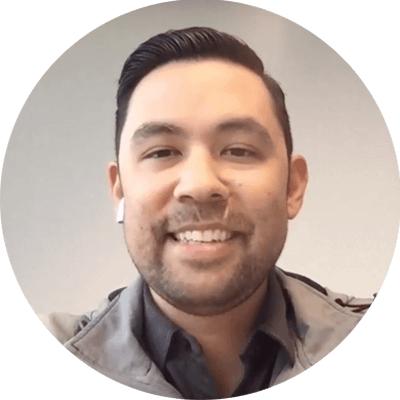 He prefers the simplicity of selling through Amazon FBA. It’s a hands off experience for sellers, with Amazon picking, packing and shipping products for you. Now that he’s establishing himself as an Amazon seller, Andrew has been doing some goal setting and some goal crushing. Andrew is married with a two-year-old son. His family was his motivation for looking for passive income. His son was just about to start play school, which can be costly. Andrew started looking for ways to recover the monthly cost – $600. After his sales picked up, he surpassed that goal. So, he made another. Andrew is a big Tesla fan. His next goal was to purchase a new Tesla 3. He hit that goal, too! “It’s been pretty cool seeing myself being able to hit those goals with Amazon FBA and your Jungle Scout program,” he said. Right now, Andrew is on the hunt for his next goal. Regrets – every seller has a few. to learn how to avoid common mistakes and build a fail-proof strategy! He shared some of his Seller Success secrets! An awesome tactic sellers can use to earn big sales and win favor with customers is by improving on products that already have demand. Read bad reviews and see what you can do to make your private label product better for customers. Andrew said most people spend too much time in the planning phase. He’s an overthinker, but he said you shouldn’t hesitate or rely on “one of these days” type of excuses. Just get started! Andrew is a firm proponent of using Jungle Scout data to find product ideas. For his first product, he went with something that didn’t have a ton of demand. He recommends always checking the data before you order. Want to know exactly what it’s like to sell on Amazon, work for yourself and build the freedom you always wanted? See how these Amazon Sellers did it.